Hi lovelies! So, turns out, I really, really like doing Gift Guides, so I'm turning it into a bit of a series, from now until early December, I'll keep posting these regularly as I find them super helpful on others blogs, so I thought why not do lots of my own! So, this one's for the boys! Or the men who are still boys at heart! My boyfriend is a bit of a big kid at times (okay all the time, but it's why I love him!) 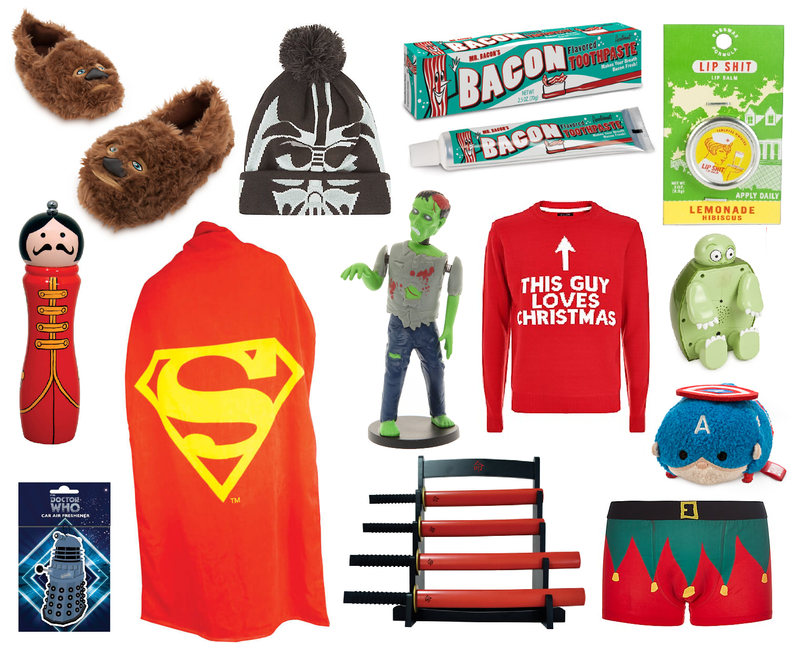 and this gift guide has been approved by him, his exact words being 'Get me any of that, except the Doctor Who thing' (not a fan). As much as guys do love their expensive gadgets and things, I don't think anyone is ever too old for a fun present, so I thought I'd pick out a few fun, but grown up items, such as the Samurai Kitchen Knives, Swearing Turtle and Sergeant Pepper Mill as well as some for the guys that just never grew up - Chewbacca Slippers and Cape Towel anyone? As a kid, I always got a soft toy of some sort in my stocking, so I think the teeny tiny Captain Ameria Tsum Tsum is really sweet. I know a lot of guys aren't into soft toys (Darren hates that I still sleep with one as he wakes up with it on his face half the time! ), but I do think a little one like this of their favourite character is actually quite a cute little gift, it could go in their car, on their desk or just in a bedroom as a cute reminder of you! What do you think? Would your boyfriend/ bother/ friend/ dad etc love anything on this list? Hi lovelies! Another gift guide for you all today! This time, for the baking fanatic in your life. 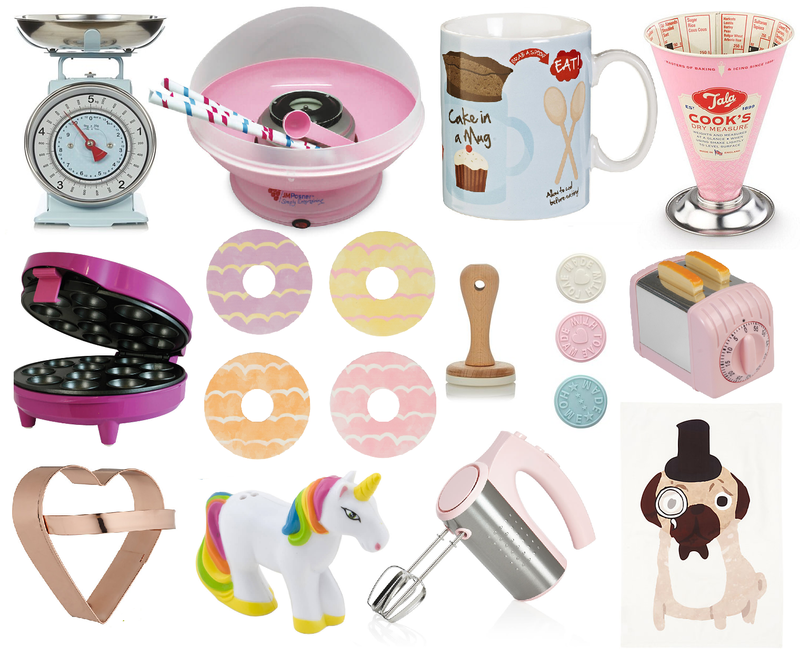 We all know someone who loves to bake and as much as baking is already a lot fun, I personally think cute, pretty or quirky bakeware can make the whole process even more enjoyable! Not all of these are actually for baking, such as the Candyfloss Machine and Party Ring Coasters, but I just had to include both of these, because candyfloss and because party rings. 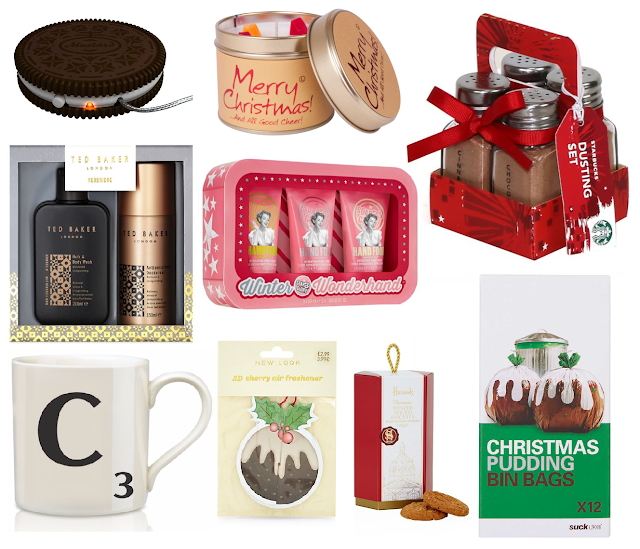 I think all of these are fab gifts as they're all so pretty and cute, but I really love are the Mug Cake Mug, which is a mug, that has a mug cake recipe printed on it, efficient. Also, I never, ever use a kitchen timer, but I really, seriously want the Toaster Kitchen Timer. So cute, so much like the toy toaster I had as a kid. I just think I need it. 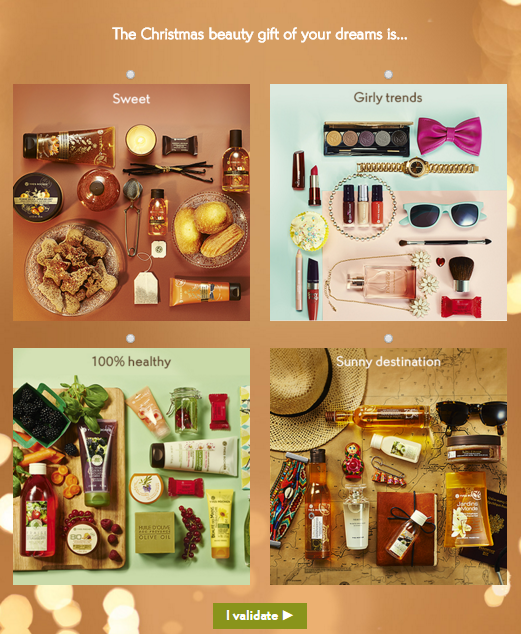 I hope you like this gift guide! Let me know your favourite in the comments! Hi lovelies! As you'll possibly know from my recent posts/ twitter/ instagram accounts, my boyfriend Darren and I are moving into our first house together next month! So, lots of pretty homeware bits have been all I can think about/ buy recently! I thought I'd share some of my favourite things we've got recently, as I think all of these would not only make gorgeous additions to our home, but also perfect Christmas gifts for someone who's into pretty homeware and useful presents. So, let's get right into it! I am obsessed with this gorgeous little Contacts and Address Book by Kate Spade. I know we have phones and things for storing things like phone numbers, emails and addresses now, but when you're writing Christmas or Birthday cards, sometimes it nicer and easier to have an address book to sit and use. Plus, it's fab quality and absolutely beautiful, so it'll look super cute in our living room! This absolute stunner was kindly sent to us by Flamingo Gifts and I am just in love with it. I think it's going to look stunning on a little side table next to our super pretty address book! Yes, it's not the most practical phone in the world as the handset is huge and it's corded, but let's be real, no one really uses their home phone that often anyway and it's basically just there to look super shiny and super beautiful. If you know someone who loves retro and vintage homeware, this could make a great novelty gift. Not exactly an essential homeware item I know, but I always use notebooks for shopping lists, christmas gift/ card lists and often I leave them out on show, so of course, it's nice to have pretty ones! The theme in our living room is going to be pink, mint and gold, so this will be absolutely perfect for that. Again, this would make a lovely gift for someone who like me, is always writing notes. I bought my sister one of these for our birthday as she's doing a Teacher Training course, so for someone like that, it would be a fab alternative to the usual spiral-bound notebooks they pick up at the supermarket! This super cute pair are actually an early house-warming gift from my Mum, she gave us them early as we need a toaster and kettle ready for moving in! As I've said in earlier posts, we're going for a retro/ vintage theme in our kitchen, as our house is a little cottage, so we thought it'd go really well! So, this pastel blue kettle and toaster will be perfect. Of course, items like this are quite personal, but I personally love receiving items like this a gift, as it's not something you'd necessarily buy yourself. I think this is perhaps something that'd be great to put on your own Christmas list if you need new appliances in your kitchen. Like the notebook, this technically isn't homeware, but I just had to include these flavoured coffees that were kindly gifted to us by Beanies. I don't often drink coffee myself, but Darren loves it and I like to have different things like this as options for guests, because I like to be the family member/ friend who says 'Sure, what flavour?' when someone asks for a coffee. No shame. These are particularly great, because they're only 2 calories per cup (before milk and sugar of course!). This Xmas Stash is perfect, because you can choose three flavours that the person you're buying for/ you love and they come packaged in a cute little gift box, which make them a really nice gift for a coffee lover. Hi lovelies! I don't know about you guys, but in the mornings, I'm all about speed, I like my makeup to be done as fast as I can, but as I run a beauty salon, I do like to go to work with a full face of well done makeup every day. I'm trained as a makeup artist, so while I do enjoy doing makeup, I also enjoy sleep, so I love a product that makes my morning routine that little bit quicker! Step forward Wonder Wand! Before I talk about the product itself, I'll just go over the brand for those who haven't heard of Bagsy before! Bagsy is a brand I've spoken and raved about before, they're fairly new on the market but I'm sure they'll soon be huge! The products themselves usually come in very simple, sleek white, silver and black packaging, but the outer packaging is super pretty, making them perfect gifts. All of the Bagsy products I've had have all come in gorgeous printed packaging (each item is packaged differently) and have cute little quotes inside, which I think is a really sweet little touch. Anyway, all that aside, let's get into the actual review. When I received the Wonder Wand, I was a bit confused. I thought a highlight/ concealer duo in the same pencil would be far from quick and easy to use and to be honest, I thought it'd be a bit of a faff. But, despite being unsure about it, I'm always up for giving things a fair try and I was also really curious as to how this would work. Well, was I surprised or what?! First I used the concealer side on some red areas around my nose (damn this windy weather!) and I was shocked at how creamy and beautiful the texture was, it slid on so smoothly and covered up the slightly dry area with no gross flakiness or patches. I then used the highlight down my nose and under my brows and then mixed the concealer and highlight under my eyes, which gave a beautiful highlighted, lifted effect to my slightly dark under eyes. So, the product went on and blended beautifully (I applied over foundation, you could apply under if you prefer, but this blended in seamlessly with my foundation so the two shades looked like a perfect match), but did it last? Well, I am thrilled to report that it seriously did. Usually. If I have any blemishes or red areas, I have to touch those up throughout the day, but this seriously stayed put. The highlight on my brow bone in particular looked fab all day long. The only grumble I have with this is that only comes in one shade. Despite the fact this shade worked really well for me, I would say if you had very fair or very dark skin, this may not work for you. That being said, this is a tad dark when you first apply but if you have a light/ medium skin tone this concealer will be perfect on its own and if you have a very light skin tone, the concealer and highlighter work perfectly when mixed together, so this could be a way around it if you do find the concealer slightly dark. To be honest, for dark skin tones, I doubt this would work and I'd really like to see a darker concealer with perhaps a more golden toned highlight for deeper skin tones. However, this doesn't take away from the fact that this is a seriously beautiful product that does the job very well and very quickly! This is perfect for all kinds of concealing and highlighting, so, as I've said, it can save time in a makeup routine and space in your makeup bag! I tend to also use a powder highlight on the cheeks, but if you prefer a more subtle look, you could highlight the nose, cheeks, brow bone, Cupid's bow and anywhere else you like to highlight with this. Overall, if you have a fairly light to medium skin tone, I'd definitely recommend this, perhaps very light skin too if you want a great under eye concealer (just mix the two sides! ), I think it would suit any skin type as it's very creamy, but doesn't slide off oily areas of skin either. For those with darker skin, perhaps Bagsy will extend their range soon! I know they have recently come out with a range of lip and cheek colours to suit darker skin types, so hopefully the Wonder Wand will soon follow suit! What do you think? What's your favourite concealer or highlighter? Do you have a favourite 'two in one' product? Let me know! The Wonder Wand is usually £18 but is currently on offer both online and in store at 10% off. Bagsy Beauty is available to buy on FeelUnique and in Debenhams. Hi lovelies! As many of you will know from my last post, myself and my boyfriend Darren are moving into our first home together as of next month. So of course, I've been doing a bit a lot of homeware shopping! Today, I thought I'd share a little haul of some of my favourite kitchen bits that we've picked up so far! Obviously, a lot of the things we've been buying are the basics, crockery, cutlery, glasses, baking trays etc etc.. But I thought I'd show you a few of the more interesting bits and bobs rather than sharing a three day long blog post full of spatulas and measuring jugs! As you'll be able to tell, we're going for a bit of a retro theme with the Kitchen. As I'm going for a bit of pink in the living room, Darren was allowed to choose the theme for the Kitchen, so 50's Diner it is! We actually managed to pick up a lot things from discount stores like Home Bargains and B&M, so if you like this sort of thing, those sort of places are just perfect. This cute little used tea bag holder is just too cute and it was only 79p from B&M - how can you possibly go wrong with that? They had a huge selection of these, but as this one matched perfectly with the Tea, Coffee and Sugar Canisters we found, it had to be this one! The Coffee Clock also matches the Canisters perfectly and was just £3.99 also at B&M. We really wanted to find a statement clock and any we found before this that we liked was just so expensive, so this went straight in our basket when we spotted it! The 'Morning Sunshine' Milk Bottle is from Asda and was on sale for only £2. We thought this would be really cute to use as a water jug when guests come over, rather than just sticking a regular jug or water filter jug on the dining table! Then of course, the infamous Tea, Coffee and Sugar Canisters! These were only £6.99 for all three from B&M and I am obsessed with them. These were actually the first themed thing we bought for the kitchen and our whole kitchen theme has pretty much been based around them. They're ceramic and absolutely amazing quality, so if you like this sort of thing, I'd thoroughly recommend them. Who spotted the milk bottles and paper straws? My kitchen will be Pinterest worthy let me tell you! Other shops I've found absolutely perfect for unique and inexpensive Kitchenware are TK Maxx and Wilko. TK Maxx is particularly fab because you can find a lot of things that there may only be one of in your store, so it's quite unlikely that your friends would have the same thing as you. This 'Flash Wash' storage thing was £3.99 from TK Maxx and is another of my absolute favourite items that we've got so far. I'm going to use this to store washing tablets, which is really handy as they're not stored away in the back of a cupboard, making them really easy to grab and use, but they'll be in this cute tin, so they'll look super cute on the counter top! The vintage Kellogg's tin was actually a freebie when you bought cereal at Home Bargains, we didn't really need a box of Frosties, but we had to have the cute tin, so we bought them anyway! They also had a Coco Pops one, which I may go back to get (and who doesn't love chocolate cereal as a treat now and then?? ), I do think these might sell out quite quickly though, so if you like this and have a Home Bargains nearby, I suggest you get down there pretty quick! I'm not sure what we'll use this for, possibly as a biscuit tin or for treats for the pooch! The set of four milk bottles and straws are from Home Bargains and cost just £1.59. I thought this was incredible, considering the price you pay for this kind of thing elsewhere. I think these will be super cute to use with the Milk Bottle Water Jug when guests come over. The heart shaped chopping board was £4 from Wilko, I love this as it's not too big and bulky and will look much cuter on the side than a regular chopping board. The set of fridge magnets was another B&M bargain for just £1.99. I'm not one for using a ton of magnets and things, but as these fit my theme so well, they're totally allowed. The Cocktail Hanging Sign was from B&M also and cost £2.99. I love this sort of thing as it just adds something a little bit fun to the kitchen! They had a big selection of these, so you could absolutely find one to suit your house. They're a cute and cheap way to change up a room slightly, so it's definitely worth a look if you're heading to a B&M Store any time soon. I actually got this fab ceramic pots and pan set from eBay on a daily deal for just £9.99. I thought orange was a nice change from all the other grey/ black/ silver cookware we already have. These aren't huge, so if you're cooking for a family these won't be great for big pots of pasta or a huge stir fry, but they a nice small size for if you're only cooking something small or for one or two people, so they're perfect for us! I was kindly gifted a voucher for Joules so of course, I had to pick up a few homeware bits with that! They didn't necessarily have the same retro theme as we were going for in the Kitchen, but they did have the pink/ navy that I'm going for in the living room and I figured, when you have a drink, you usually have it in the living/ dining area anyway, so I thought these colours were perfect! The set of four mugs are £36.95, so not the cheapest, but they do make a gorgeous gift for someone, particularly if you're looking for Christmas presents for someone who's a little hard to buy for! The quality of them is fab and they have several different gorgeous designs. As I said, I went for these to match my living room, but they have lots of others so it's worth a look. All of them have different designs on the outside, a Joules logo on the inside and a little pattern on the bottom of the mug, so the attention to detail on these is just beautiful. I didn't want to unwrap all the tea towels before we get to the house, but basically, they are each sets of two large tea towels with print that match the mugs. These cost £12.95 per set, so again, perfect for a gift or a special treat for yourself! Although these don't really match the kitchen them either, tea towels aren't really on show too much anyway! I got all three of the nautical tea towel sets because I really don't think you can have too many tea towels as they're constantly in and out of the wash. These ones may just make washing up a little more bearable as they're so cute! Maybe not, but I can only hope. So, let me know what you think! What's your favourite thing from my haul? Also, if you have any recommendations for cute, cheap homeware shops/ brands please let me know in the comments!